More than half of the homes in the United States use natural gas for heating, cooking, and more. It's an efficient, clean fuel source, and it has a multitude of applications. Most of the time, natural gas lines and appliances are totally safe for use. 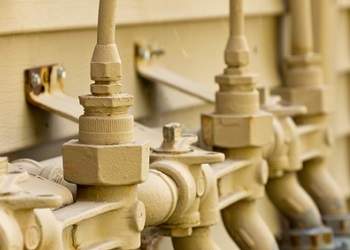 However, any problems with your gas line can result in very dangerous situations. Even the smallest leaks in your gas line, for instance, can cause explosions or even carbon monoxide poisoning. At Franklin Plumbing & Drain Cleaning, our plumbers know how important it is to keep gas lines in Columbia and surrounding areas of South Carolina functioning well and safely at all times, so we take any gas line services we perform very seriously. We do whatever it takes to help you keep your gas lines in excellent condition. Call us today to schedule your gas line services, and we'll be looking forward to assisting you. Do not use your cell phone until you are a safe distance from your home. Shut off all gas valves. Do not attempt to locate the leak. Do not turn any electrical appliances on or off. Do not smoke or use any open flames. Get a safe distance from the house, then call 911 and the utility company. Our plumbers in Columbia, SC will be able to safely and thoroughly repair any gas line leaks. Installing gas lines to your homes may be necessary if you're adding any new gas appliances, like stoves, water heaters, or furnaces. Our plumbing services will be able to take care of every part of the job, from obtaining the proper city permits to inspecting your property and ensuring that your new gas lines are totally up to code. For quality gas line services in Columbia, SC and the surrounding areas, please call Franklin Plumbing & Drain Cleaning at 803-799-2222 or complete our online request form.